In more than three decades of my Christian life, I have been blest by 2 types of Daily devos' (matter not exceeding 500 words) in universal Christian literature. Not only those Devos' which have a different theme everyday but also the ones which revolve around a certain theme over a period of time, say a fortnight have richly edified me. In fact, both styles have their own inherent advantages. If the former style caters to the varying spiritual needs of a christian from day-to-day, the latter aims 'to ground' a child of God in a certain subject in order he derives the full benefits of the deep insightful study of a certain topic, spread over a fixed span of time. For starters in the first month of January I would be dwelling on the theme of the "Christian Journey", with the material being arranged in a Book-like format under which the pages would be opened ( i,e..displayed on-line) on each succeeding day. Yet another manifestation of losing the �first love� is outright disobedience. 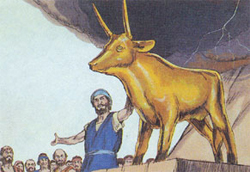 Though, clearly commanded not to worship idols (Exodus 20:4-6), the emancipated Israelites resorted to the detestable act of worshipping a �Golden calf�, as soon as their strong & devout leader Moses departed from them temporarily to receive God�s laws on Mount Sinai. 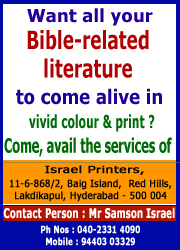 This �Golden calf� was supposed to guide them in Moses� absence (Exodus 32:1). Once again, without condoning their despicable acts, if we as Christians undergo a honest reality check ourselves, it would emerge that we have too �trusted� many �idols�, to deliver the �goods for us�. To have a healthy bank balance or miracles-performing spiritual guide is not wrong in itself but the question is �who are we trusting� eventually! Rephrased slightly, in all earnestness, in whom does our �security� lie? In the omnipotent, loving God who is well able to lead us or in some man-made god like money or a charismatic spiritual leader, who himself is a servant of the great, incomparable God? Even in a family relationship, let�s never forget the fact, that ultimately that it is �Jehovah-Jireh� who provides for our needs by using our own near & dear ones�! It wouldn�t take Him long to prove that even the most reliable individual amongst us has �a feet of clay�! Even as we examine our hearts, let�s humbly submit ourselves into His hands to be led by Him & provided by Him alone�in our ethereal journey. Father, I confess of my many falls� in my spiritual life, consciously or unconsciously. Cleanse me of all the �hidden idols� of my heart, so that I depend on You alone, for all my needs. In Jesus Name.